The mayors of Kyiv and Kyoto agreed on closer cooperation between the cities and mapped specific steps for the short perspective, according to the press service of the Kyiv City State Administration. In the near future, a group of Ukrainian students, who deal with innovation, technology, and design, will arrive in Kyoto Research Center. Also, a group of students from Kyoto University will come to Kyiv and join city hubs. 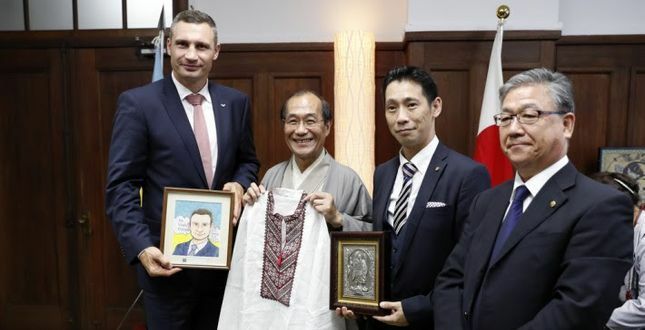 This was agreed during Klitschko’s visit to Kyoto Research Park and ASTEM as Kyiv and Kyoto celebrate the 45th anniversary of sister cities agreement on September 7, the press service wrote. The Japanese side promised to assist with the implementation of their high-tech solutions in public transportation to make it more comfortable for Kyiv passengers, the mayor of Kyiv Vitali Klitschko said after the meeting with his Kyoto counterpart Daisaku Kadokawa, the report reads. Read alsoKyiv mayor, Chinese ambassador discuss investment, tourism“2017 is proclaimed the year of Japan in Ukraine. And we are preparing for it. Particularly, we will renew Kyoto park in Kyiv. It will be very symbolic if we manage to arrange it as a real Japanese garden with truly Japanese atmosphere,” Klitschko said after the meeting with the Kyoto mayor. “We are glad to cooperate in the implementation of Smart City solutions, exchange in the spheres of culture, which is very successful, education, and science, which we have agreed during my visit,” Kyiv mayor said. President of Kyoto Research Park (incorporates ASTEM) Kazuya Matsuo emphasized that such scheme of operation of a scientific center had already proved to be successful. “It is very important to help small and middle business develop and grow into big companies. We accumulate extensive experience. We will be pleased to assist Kyiv in experience sharing and bring new technologies for business, as the implementation of modern solutions makes people’s life better. Our center together with university students works on new technologies which we then offer to enterprises to improve their services or production,” Kazuya Matsuo said. Vitali Klitschko pointed out that Kyiv is interested in the implementation of modern technologies. “We all understand that hi-tech is a priority of cities and countries. Japan is a global leader in generation and implementation of modern technology. And we are grateful for readiness for effective cooperation to use the experience to make Kyiv a modern and comfortable city,” Klitschko said. ASTEM is one of the leading Japanese institutions, where scientists and students elaborate new technologies and innovations, which are later implemented in business. Today, 17 global companies are located in Kyoto and work with ASTEM. Seven scientists from the Center have become Nobel Prize winners.